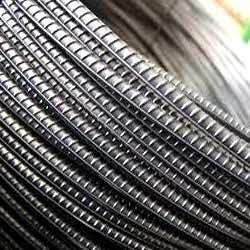 Prominent & Leading Manufacturer from Chennai, we offer reinforcement steel rebars. We offer a wide range of Reinforcement Steel Rebars, which is used in reinforced concrete and building structures. Our organization enjoys a sound technical collaboration with Hennigsdorfer Stahl Engineering GmbH Germany, which helps us to manufacture a high quality range of quenching and self tempering (QST) rebars. Around 100 steel plants including SAIL have received the THERMEX cooling Technology from Hennigsdorfer Stahl Engineering GmbH Germany, which has proven to be useful in the production process. Owing to the use of this technology, we have been able to deliver rebars, which are corrosion resistant and durable. Looking for Reinforcement Steel Rebars ?